Yakuza is a series with a strange and convoluted history outside Japan, where it is known as Ryu ga Gotoku (Like a Dragon) and is one of Sega’s most popular franchises. There have been several points in time where Sega has seemingly given up on even attempting to sell this series to western audiences, but much like its main protagonist Kazuma Kiryu, Yakuza has fought like a… beast to survive the ordeals thrown its way. In recent years, Yakuza has become something of a pet project for Sony of America, and thanks to more efficient marketing and positive word of mouth (helped by the PlayStation 4’s video sharing feature enabling players to show off the best and craziest moments), these games are finally finding the audience they so richly deserve. However, we are getting slightly ahead of ourselves. Let’s start off by taking a look at where this franchise began. In the early 2000s, after Sega bowed out of the console hardware business, producer Toshihiro Nagoshi (pictured below; image from Niche Gamer) got the idea to create a game that would appeal to an older and more mature audience, with the popular PlayStation 2 as the release platform. Nagoshi took inspiration from gangster movies such as those directed by “Beat” Takeshi Kitano and decided to set the story in the Tokyo red-light district of Kabukicho, fictionalized in the game as Kamurocho but closely resembling the real-life district down to the map and various landmarks. Seriously, I’ve seen a side-by-side comparison of the actual Kabukicho map and the Kamurocho one, and it’s nearly identical. One could probably navigate the real district with nothing but their knowledge of the games. The main plot of the first game was written by novelist Hase Seishu, who also came up with the Ryu ga Gotoku title (actually romanized as Ryū ga Gotoku, but for the sake of convenience I’m going with “Ryu”). The title, as you can probably guess, was meant to make the players of the game feel immensely powerful just like the protagonist. And what a protagonist that is. Kazuma Kiryu starts off as an up-and-coming member of the Tojo Clan of yakuza, about to start his own family within the clan despite being only 27 years old at the beginning of the story. Kiryu is known as the Dragon of [the] Dojima [Family] because of his fighting skills, but he also has a strong sense of honor and unwavering loyalty to those close to him. This loyalty causes him to take the fall for a murder he did not commit, and consequently go to prison for ten years. The actual murderer happens to be Kiryu’s best friend Akira Nishikiyama, and the victim is their boss Sohei Dojima. Nishiki kills Dojima for trying to force himself on his and Kiryu’s friend/love interest Yumi Sawamura, who goes missing immediately after the incident. 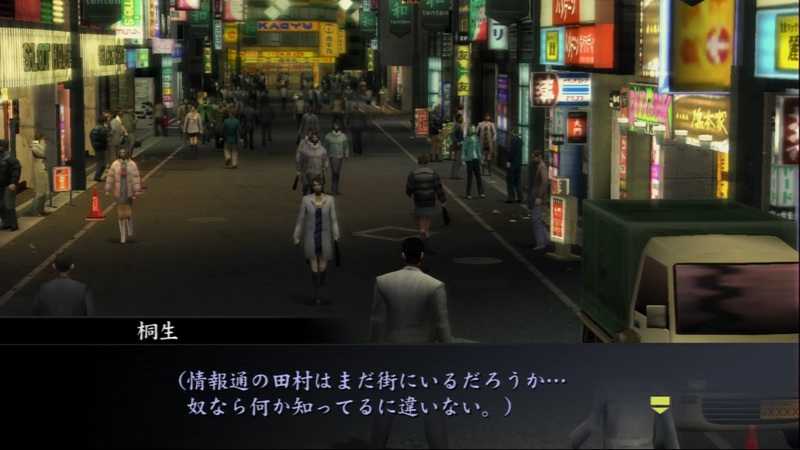 Kiryu ends up going to prison in Nishiki’s stead, because the latter has to take care of his terminally ill sister. These, by the way, are not spoilers, as all of this happens in the first 30 minutes. When Kiryu returns from jail in 2005, things have changed. Not only has he been expelled from the yakuza (killing your boss tends to result in something like that, but usually much worse), but Yumi’s still missing and Nishiki has turned into a cold-hearted psychopath. Oh, and someone has stolen ten billion yen from the Tojo Clan. Kiryu inevitably gets mixed up in the Tojo Clan’s politics, especially when he encounters an orphaned little girl named Haruka who appears to be somehow connected to the ten billion yen and targeted by the yakuza… and also happens to be Yumi’s niece. At its core, Yakuza is a 3D beat ’em up set in an open world, with random goons popping up fairly often to challenge Kiryu as he runs around Kamurocho. These fights around town are basically random JRPG battles, complete with a (rather lengthy) transition from the map to the fight scene. As far as open world environments go, Kamurocho is fairly small but makes up for that in environmental detail and the activities Kiryu can partake in. You can go gambling, visit restaurants and stores (including real-life retail store Don Quixote, complete with its catchy jingle), hang out at hostess bars, play the crane game at the Club Sega arcade, participate in underground fighting tournaments, and so on. There aren’t as many activities here as there would be in the later games, but for the time this was quite impressive and helped flesh out Kamurocho, increasing the player’s immersion. In many ways, Yakuza feels like a spiritual successor to Shenmue, although the interactions with the world aren’t quite as detailed and the game uses a fixed camera system. Kamurocho is also split into far smaller chunks than Shenmue, with the game stopping to load for a moment whenever you hit the edge of the current area. There are also a few combat stages that use a more conventional camera system and are more seamless than the exploration, and usually feature Kiryu beating the tar out of a building full of enemies. To clarify, he beats the enemies inside the building and not the building itself. although he does break a statue with his bare fist in one cutscene. The combat system is fairly simple. The Square button is your quick attack which can be chained up to four times, with the Triangle button serving as a strong attack or a finishing blow to a combo. L1 can be used to block and R1 locks on to enemies, and pressing X and a direction while locking on lets you dodge attacks. The O button grabs enemies (and picks up weapons that can be found scattered around), and from there you can either use Square or Triangle to get a few free hits in or press O again to throw the enemy. You can also drag a grabbed enemy towards objects in the environment and, if your Heat meter is full, press Triangle for a devastating Heat finisher. You can unlock more combos and Heat moves for different situations with EXP earned from fights and completing side quests, most of which involve some idiots trying to scam Kiryu and getting curbstomped for their efforts. Leveling up one of the three stats (Soul, Technique, and Body) also allows you to increase Kiryu’s maximum health and improve various abilities such as his dodges or grabs. In addition, Kiryu can learn new special moves (under the Special stat, fittingly enough) from an old martial arts teacher he meets a few chapters in, and while the training sessions are often tough it’s a very good idea to learn these moves because Yakuza can be a frustrating game at times. The main cause for frustration here is the wonky targeting system, especially when it comes to longer combos. Once you’ve started a combo, you can’t change direction until the animation is finished, and by that time you’ve likely been clobbered in the back of the head with a baseball bat or any number of foreign objects. Items can be used to heal Kiryu or boost his Heat meter, although inventory space is very limited and the nine slots are shared between items and equipment. Boss fights in particular tend to be quite annoying, especially against more mobile enemies such as the deranged Goro Majima. 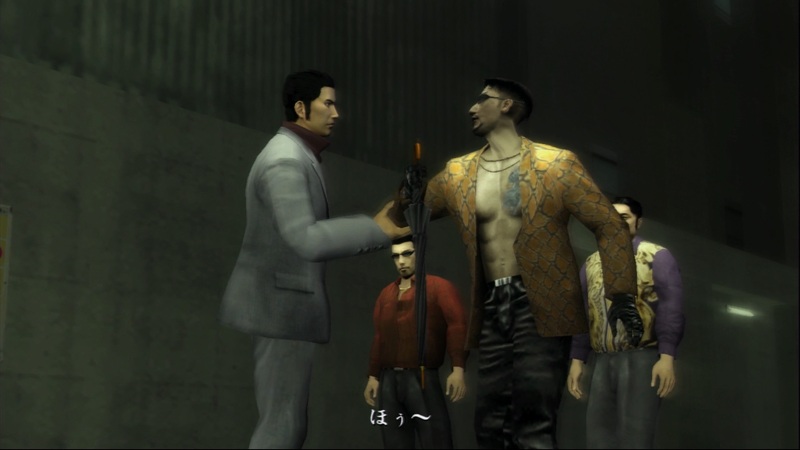 A longtime fan-favorite character, Majima is a cackling knife goblin who attacks and dodges at the speed of light and shows up to pester Kiryu a couple of times during the story. He appears to have some sort of a weird psycho mancrush on our hero, and declares that only he’s allowed to kill Kiryu. In the later Yakuza games, Majima becomes a more sympathetic and much sillier character, but here he’s basically just a psychotic villain and genuinely scary because of his unpredictable nature and violent temper. When Sega decided to bring Ryu ga Gotoku overseas, they actually put quite a bit of effort into the localization. Obviously, the title was changed to Yakuza which sounds a lot catchier than “Like a Dragon”, but Sega also made the decision to dub the entire game into English. To that end, they brought in a number of fairly big names such as Michael Madsen, Eliza Dushku and Mark Hamill. The end result is… well, not all that great, honestly, although Mark Hamill as Majima is pretty much perfect casting and does a great job voicing the character. Meanwhile, Darryl Kurylo puts in a fairly inoffensive performance as Kiryu, but is no substitute for the dulcet tones of Takaya Kuroda. A lot of the voice work sounds rather flat and uninspired, with the occasional pronunciation issue with all the Japanese names. There is also roughly 3000% more swearing than the original script had, both voiced and unvoiced. Yes, the characters in Yakuza are almost as fond of dropping F-bombs as Tony Montana, and it gets to the point where all the swearing and “gritty” gangster talk becomes unintentionally hilarious. It doesn’t fit the style of the game at all. The PAL version, which is what I own, supports 60 Hz and has a few subtle differences to the American release, mainly involving the interface. The script has been modified to use UK English spelling and vocabulary, and since the game was also translated into various other European languages Sega chose to minimize the amount of English text on the interface itself. For example, a button prompt that would say “Grab” in the NTSC version is just an icon in the PAL release, and the Body, Technique, Soul and Special stats use their original Japanese names… meaning that nobody playing the PAL version will understand what they mean unless they speak Japanese. Good job, lads. At least the manual (remember those?) offers translations, and the skill gauges are fairly self-explanatory regardless. Ryu ga Gotoku was rereleased in Japan on the PlayStation 3 and Wii U, as part of the Ryu ga Gotoku 1&2 HD compilation. This version fixed a few annoyances such as the load times and the clunky item storage system (allowing you to store items at save points instead of having to trek to the nearest item box), and featured some minor gameplay additions along with a 1080p presentation at 60 frames per second. Or so I’ve heard, I’ve never actually played the HD remaster… Well, I just bought a copy on eBay, because why the hell not. UPDATE: I’ve been messing around with the HD edition and it does run at 1080p and what seems like 60 fps (I have no tools to actually measure that on console games, but the frame rate does at least look and feel smoother than before), with a bit of a caveat. See, the animations seem to be tied to the original 30 fps, so they look rather choppy even though the gameplay itself feels much more fluid than on the PS2. Redoing all the animations may have been outside the scope of the HD remaster project (as is often the case with games from this era), and it is still an improvement overall. On top of the other quality of life fixes I mentioned above (the load times are the biggest improvement, as they are now practically nonexistent), the action stages now feature full horizontal camera control so you no longer need to press L2 to center the camera behind Kiryu. 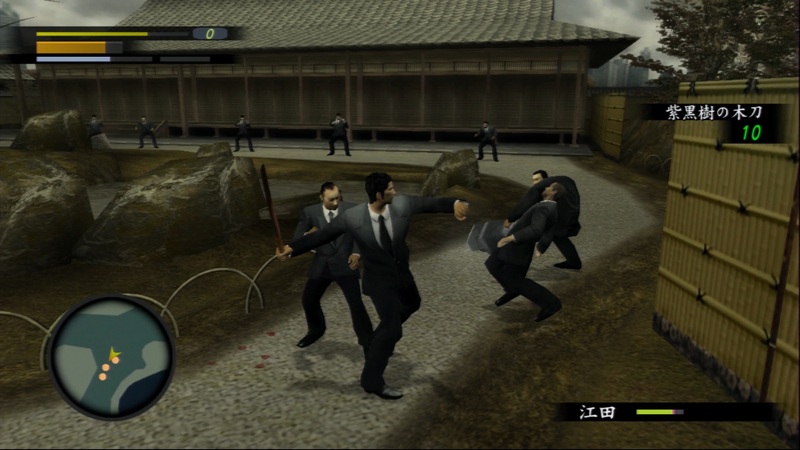 The combat itself hasn’t changed in any meaningful way, so this is still very much Yakuza 1. That being said, if I ever replay the game, I’ll definitely be doing it on the PS3 because the HD version simply feels much better to play than the original. A more ambitious remake came out on the PlayStation 4 in 2016 (2017 in the west) in the form of Ryu ga Gotoku Kiwami, or Yakuza Kiwami as it’s known over here. I will not go into too much detail about Kiwami in this article because it deserves its own writeup later on, but the gist of it is that Kiwami is a full remake of the original game with many new features, and runs on the engine from Yakuza 0. But yeah, as I said, that’s a story for another time. Sadly, the PS2 release of Yakuza didn’t do particularly well and only sold about 100,000 copies in North America. The poor sales didn’t stop Sega from bringing the sequel over, and we’ll be talking about Yakuza 2 next time. In the meantime, feel free to head on over to the YouTube channel and watch my ongoing Let’s Play of the original Yakuza!